If you’ve ever been in the car with a child constantly asking, “are we there yet?” you know how annoying a repetitive question can be. Unfortunately for Windows users, Microsoft has decided to take this method of annoyance to their own customer base, constantly nagging them to upgrade. If you’re as sick of this as thousands of other Windows users are, then here’s how you can zip the lid on Microsoft’s prompts. If you’re like many people who are happy with their current Microsoft operating system, you may have no desire to upgrade to Windows 10. And while Microsoft seems to be doing everything they can to force your hand, like no longer offering security updates for Windows 8, upgrading is still avoidable for now. So if you’d like to get rid of the annoying prompts that are likely pestering you on a regular basis, it is possible to do so. And believe it or not, Microsoft themselves have released instructions on how to do this and they can be found their website. To block Windows 10 popups, you will need to dig into your PC’s registry and disable the upgrade path. 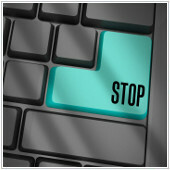 However, a word of warning before you start: editing your registry incorrectly can cause serious problems to your PC. Before you make any modifications, back up your computer and registry in case anything goes wrong. In other words, at this point you're proceeding at your own risk. If you are a Windows 7 Pro, Ultimate or Windows 8.1 Pro user and have admin permissions on the computer, follow these steps. And that’s all there is to it. Now you will no longer be bothered with popups bugging you to upgrade to Windows 10. That being said, if you are currently running Windows 8 you need to make sure that you've upgraded to the latest “8.1 Update” version of the software so that you can enjoy continued 'Mainstream Support’ (including new features) until 9 January 2018 and ‘Extended Support’ (security patches) until 10 January 2023. If you're running the original Windows 8.0 you will no longer have support and your systems could be at risk. If you would like additional assistance in blocking Windows notifications or help with other IT related needs, we are happy to be of service. Get in touch with us today.